Customer Relationship, CRM technology, Organizational incentive, Organizational Capital. In recent years, researchers and academicians have tried to identify antecedents and consequences on overall CRM performance. Except a few studies (e.g.Chang, Park, &Chaiy, 2010), there is a scarcity of studies that have tried to look into the antecedents of the actual usage and variety of CRM technology in an organization. The extant literature on antecedents mainly comes from the TAM (Technology Acceptance Model). But, there are several other factors that could contribute to the better usage and implementation of CRM technology and Organizational Capital seems to be one of them. Consequently the main objective of this study is to examine the impact of Organizational Capital on the CRM Technology use. H1 : The Organizational Capital positively associated with the use of CRM technology use. Primary research hypothesis with respect to antecedents of CRM technology use intends to examine the impact of Organizational Capital on CRM Technology use as a whole. In order to know the individual impact of each subconstruct of Organizational Capital on the CRM Technology use sub-hypothesis were developed and the conceptual framework is presented in figure 1. . Testing of these hypotheses will provide deeper insights with respect to the individual effect of these components on CRM Technology use and whether all of them are significant at their individual level or not. Based on this idea following sub-hypothesis have been developed. H2 : Employee training is positively associated with the use of CRM applications. H3 : Customer centric management system management is positively associated with the use of CRM applications. The data was collected from sales and marketing managers of 155 firms from pharmaceutical industry with the help of self administered questaionnaire. The list of companies was obatained from BSE (Bombay Stock Exchange) official website. The list includes a combination of both top and low level companies in terms of market share. Organizational Capital construct was measured by 10 item scale, which includes its three subdimensions i.e., Employee training, Customer Centric Management system, and Customer Relationship Orientation (John, 2017). In order to measure the CRM technology use, an index originally developed by Jayachanderan et.al., 2005 was used. The index was initially refined with the help of Confirmatory Factor Analysis. The results of the measurement model are presented in table 1. The ideal ÷2/df ratio lies between 1-5, whereas GFI values approaching .9 indicate a good fit. Similarly the CFI value in this particular model is well above the cut off level of .9 indicating a good fit. 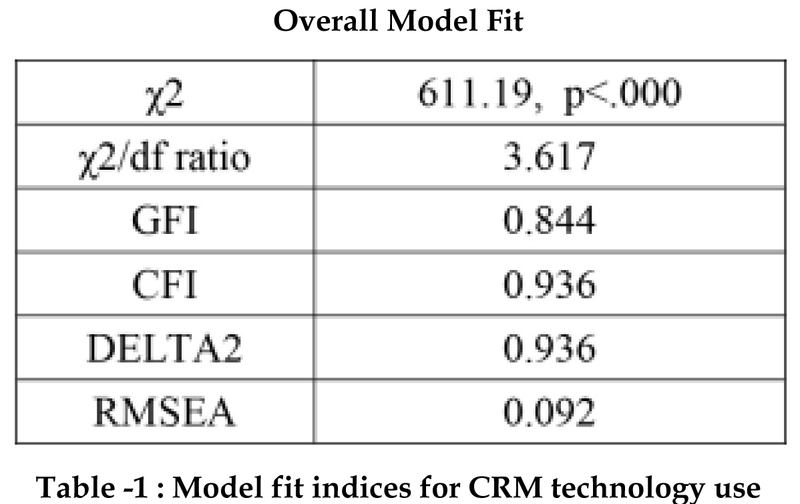 Looking at the different model fit indices in table above it can be inferred that a three factor model of CRM technology use best fits the data. First structural model was run on constructs of Organizational Capital and CRM technology use in order to assess whether higher deployment of Organizational Capital leads to the subsequent higher use of CRM Applications. In line with the suggestions of Anderson and Gerbing (1988), the model fit indices of the model were also checked for in order to determine the overall fit of the structural model. The model fit indices of the Organizational Capital-CRM Technology use structural model indicate that it is a sufficiently good fitting model. 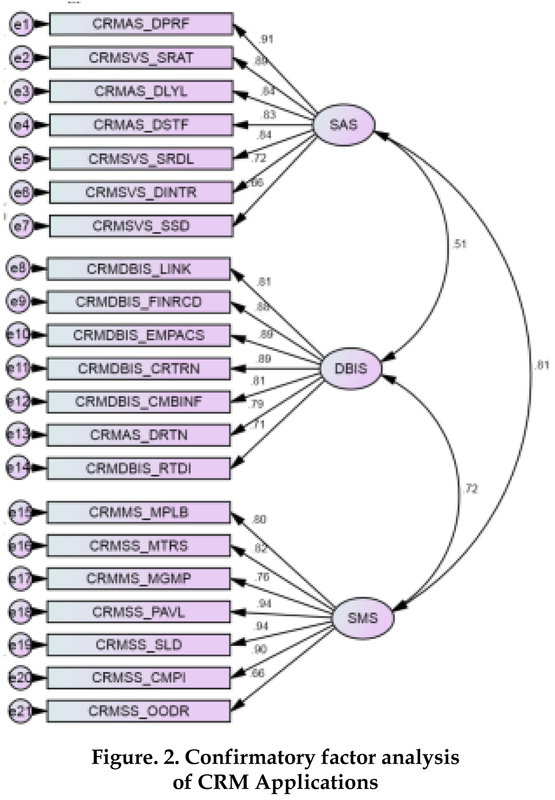 The model fit indices of the OC-CRMA structural model are presented in table 6.19. Figure 6.12 presents the overall model path structure. This initial structural model consisted of second-order constructs and has been labelled as OC-CRMA model A. On examination of the regression path from Organizational Capital to the CRM Technology use construct, it can be seen that there is a very strong and significant impact of the Organizational Capital on the CRM Applications. The standardized estimate or standardized regression coefficient between these two constructs is 0.828. Moreover, looking at the standard multiple correlation coefficient/ coefficient of determination (R2) it can be seen that it is as high as 0.69 suggesting that Organizational Capital on Capital explains 69 per cent of the variation in the CRM Technology use variable. The results of the path analysis are presented in table 6.20. 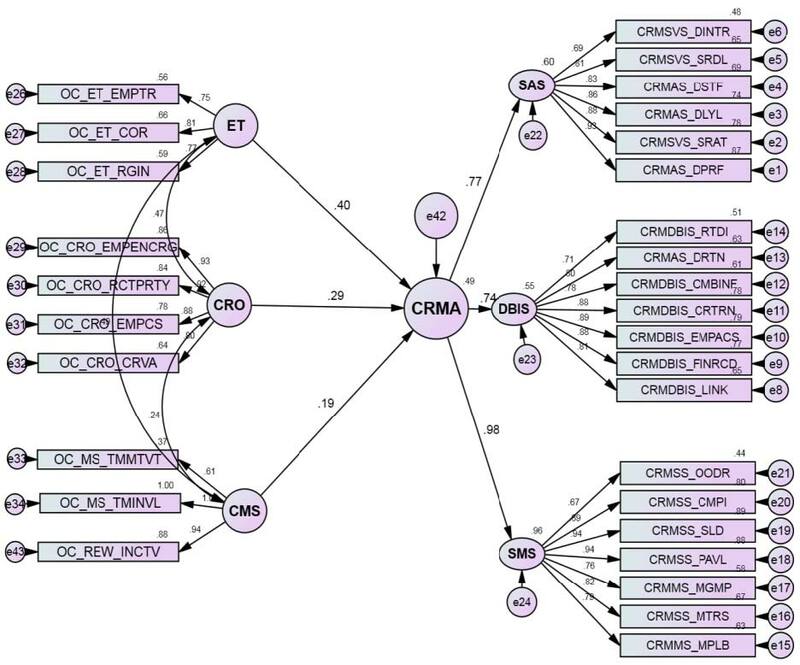 The results of this structural model analysis clearly suggest that Organizational Capital has a strong and significant relationship with the use of CRM Applications. Thus, the first major hypothesis (H1) of this study is supported. In order to check the impact of the individual dimensions of Organizational Capitali.e. Employee training (ET), Customer centric management system (CMS), and Customer Relationship Orientation (CRO) on CRM Technology use the first structural model was revised and Organizational Capital dimensions were incorporated in the in their first-order nature whereas the CRM Technology use construct was retained in its second-order form in order to simplify the interpretation of the results and avoid unnecessary complexity in the model. This model was labelled as OC-CRMA structural model B. Fit indices of the model are presented in the table 4. The results of this model indicate that there is not much change in the values as for as the fit indices are concerned and the model exhibited a suitable fit like its earlier version. 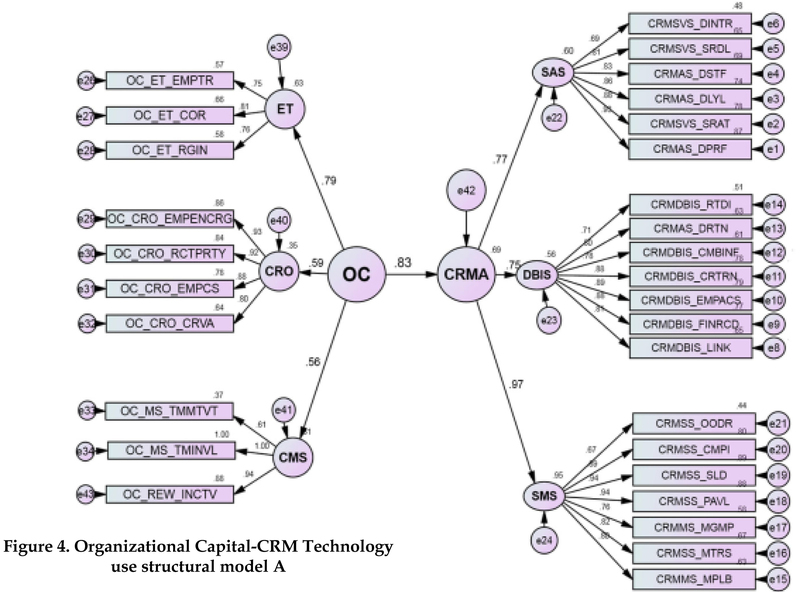 The model shows that all the three paths between three dimensions of Organizational Capital and CRM Technology use construct are significant with positive standardized regression coefficients indicating that all of them positively predict the use of CRM Applications. Among the three dimensions Employee training turned out to be the strongest predictors of the CRM Technology use with an estimate of almost .40, whereas Customer relationship orientation and Customer centric management system fell second and third in the order with estimates of .29 and .19 respectively. Thus it can be seen that all three components of Organizational Capital predict the use CRM Technology use in an organization and are equally important. However, the Employee training is the most important dimension among the three. Another important result obtained from these two structural models is that both the models behaved suitably well in their first order and second order nature. The overall results of the model are presented in table 6.22. 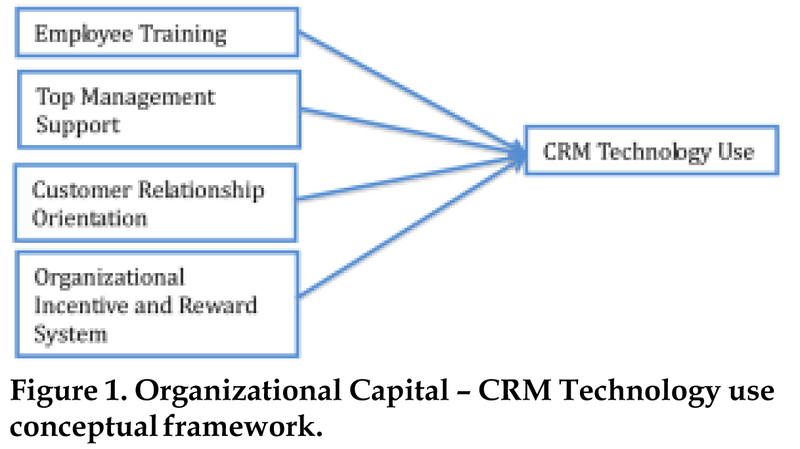 The results from the first structural model clearly indicated that all the three components of Organizational Capital i.e., Customer centric management system, Customer Relationship Orientation and Employee training together are strong predictors of higher use of CRM Technology use within an organization. This suggests that Organizational Capital is the essential organizational transformation, which predicts the use of CRM technology in an organization. It also shows that a firm should work on all three components of Organizational Capital simultaneously if it intends to encourage its employees to use the CRM Technology use and also make the overall CRM technology work with greater benefits. These results are in line with the previous research which suggest that customer oriented organizations are more likely use CRM technology on a higher end and benefit from it consequently (Chang, Park & Chaiy, 2009; Day, 2003). These results show that while organizations try to make the CRM implementations a success, all three factors need to be managed equally. The organizations need to foster a culture that recognizes customer relationships as valuable assets. As expected, the results also indicated that Employee training was the strongest predictor of use of CRM Technology use and its role in successful implementation and use of CRM is quite evident. Thus, apart from these intangible resources the organizations also need make some investments in training the employees so that the CRM related tasks can be understood and performed by the employees in a smooth manner. Developing incentive schemes to attract the customer relationships will keep the employees motivated to be engaged in CRM programs. This study provides some useful insights despite some limitations. One of the limitations is that the data has been taken from Indian pharmaceutical industry. The future researchers may include samples from various industries in order to generalize the results. Further, some more factors may be included in the Organizational capital construct as the research related to this construct is very sparse. The CRM tehnology as such has evolved a lot during last few years and therefore CRM technology use index used in this study may not be a comprehensive index in terms of functionality aspects of CRM. The future research may focus on making this index more comprehensive and complete in order to measure the actual picture of CRM technoogy in an organization at a particular point in time. Boulding, W., Staelin, R., Ehret, M., & Johnston, W. (2005). A customer relationship management roadmap: What is known, potential pitfalls, and where to go. Journal of Marketing, 69(4), 155-166. Chang, W., Park, J. E., & Chaiy, S. (2010). How does CRM technology transform into organizational performance? A mediating role of marketing capability. Journal of Business Research, 63(8), 849-855. Day, G.S. (2003). Creating a Superior Customer- Relating Capability. MIT Sloan Management Review, 44(3), 77-82. Hunter, G. K., & Perreault, W.D. (2007). Making Sales Technology Effective. Journal of Marketing, 71(1), 16-34. Jayachandran, S., Sharma, S., Kaufman, P., & Raman, P. (2005). The role of relational information processes and technology use in customer relationship management. Journal of Marketing, 69(4), 177-192. John, W. (2017). Measuring Organizational Capital in CRM context : An EFA Approach. FIIB Business Review, 6(4), 39-47. ·Payne, A., & Frow, P. (2005). A strategic framework for customer relationship management. Journal of Marketing, 69(4), 167-176.